This is the first book that I downloaded on my Kindle. I am not through reading it, though. p.s. I checked the map and noticed that there are a series of quakes just outside San Jose. These must be the ones you felt. It is amazing that they happened around the same time the geyser quakes. of December 31st. I appreciate it if you provide more info. During my school days, I thought about the gravitational tug of the moon on the the Earth, and the stresses it exerts on the faults. Interesting. So, you got your Kindle now, ha! How is the fonts though? Are they easy to read? I mean when I spend time behind my PC my eyes get irritated after a while, is it the same with Kindle? As for the quakes; my area is very close to Milpetus around which the quake was reported. And the area is north of San Jose, so you are right. As for the blue moon effect I have no idea, too bad I did not get to see the full interview, I googled it and did not get much either, but I think it was James O. Berkland who was interviewed, not sure though. The Kindle screen is not backlit. This is good and bad. There is no glare to strain the eye. However, you cannot read in dim light. The graphics are good. I am reading right now a book on chess strategy, and the diagrams are clear. The font can be enlarged. As this is the first generation, it has its shortcomings. Not bad for carrying a whole library while travelling. I think I would wait on that till it becomes ‘Darweeshi’ as my father always says about new technologies in the market. And what he means is ’till it gets better and cheaper’. Just read the National Geographic article. Yes, the full moon occurred close to Earth’s perihelion. During these conditions, the Tectonics plates that meet on the foothills to your east will start to dance. But, come to think about it; come what may, I can’t part from Silicon Valley, it has become my home and I love it here. I guess I will get used to quakes, and worse come to worse, we’ll all die one day. I forgot to add that one more condition must be met before the big one happens. actually, it more of a result than condition. There is also a total eclipse. When the sun, earth, and moon are on a straight line. So as you can see, this is even more rare. Relax, after all, you are between the San Andras fault,and its branch, the Calaveras fault. Away from both strike faults . p.s. Observe Duke’s behavior. Dogs sense tremors days before humans feel them. Well, my friend Linda heard in the news that we should be expecting a big quake, but they didn’t say when. In any case I have my water bottles and plastic bags ready just in case. And talking about Duke; he’s been acting weird lately, he usually doesn’t bark at all, but about few days before the quake he’d jump all of a sudden and bark. He hasn’t done it lately, so I guess we are OK. 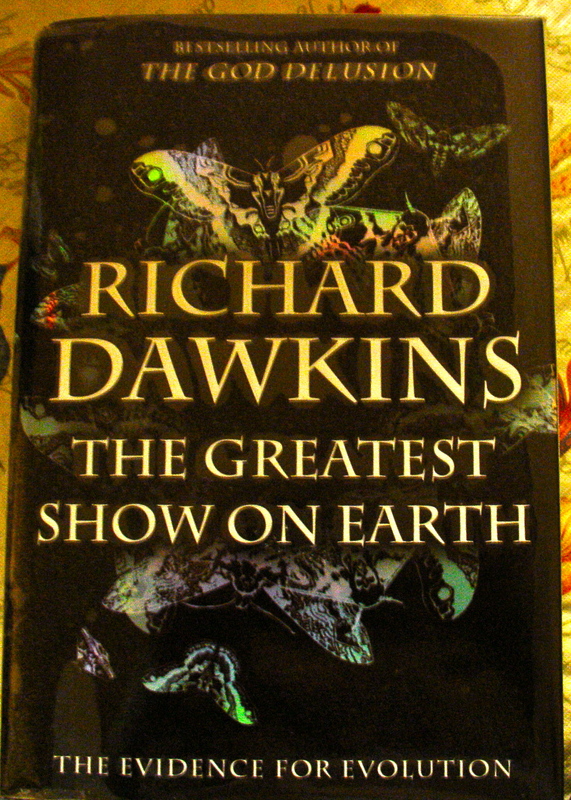 I am really looking forward to reading the book, I watched a few interviews about the book and heard a reading by Dawkins, and I am thrilled..
I’m sure you’d enjoy it immensely. As for the youtube clip I’m not sure which one you’re talking about!